Ingredient variability is rarely a good thing, especially when it comes to construction materials. 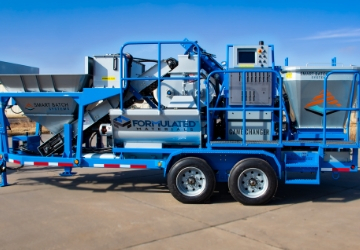 Smart Batch Systems has solved the problem with its GC-1 mobile mixing machine. Smart Batch takes the guesswork out of preparing a gypsum underlayment for flooring with its premeasured bag that is loaded into the GC-1 for mixing. It not only makes mixing simpler, it drastically reduces dust and waste, saves time and increases safety on the job site. But when Smart Batch began developing the newest model of the GC-1, it ran into a problem. The engine needed to meet the more stringent Tier 4 emission standards. Every option that was being considered either didn’t meet the GC-1 requirements or was cost prohibitive. Then Smart Batch, which is based in Norman, Oklahoma, called Rick Staton, our Perkins Pacific salesman who works in the Oklahoma City office. “We went all over the country and found something in our backyard,” said Shashank Ramarao, Engineering Manager for Smart Batch Systems. The solution is a Perkins 1204f engine. The four-cylinder, 4.4-liter 110hp engine gives Smart Batch multiple options for configuration. The compact size makes installation easy, and it is Tier 4 final, meeting the necessary emission standards. “There’s been no looking back on our decision,” Ramarao said. The upgraded GC-1 gives customers a machine with even greater features that primarily focuses on providing users with data to monitor metrics like run time, batch mixing and pump functionality. Ramarao said that the new GC-1 takes the guess work out of managing the ingredient mix and provides a daily report that operators can use to ensure the machine is running efficiently. Typically, construction crews would need to deal with opening up to 600 bags of material and individually managing the mixing. That leads to increased dust, the potential for injury by lifting and maneuvering so many bags and ups the potential for human error in getting the correct ingredient mix for the material. By comparison, the Smart Batch System involves dealing with 16 premeasured bags that are lifted by machines and mixed electronically, ensuring a more consistent product. Smart Batch featured the newest model at the recent World of Concrete trade show in Las Vegas. That machine has already been sold and production is ramping up to meet customer demand. Staton said the Perkins Pacific team was able to put together an engine package that is ready to go. “It’s been great working with a local company and being able to deliver on our promises and hit the benchmarks Smart Batch needs,” Staton said.